Publisher: Margaret K. McElderry, 2011. Tessa is relatively safe at the London Shadowhunter institute, but when the Clave seems intent on removing Charlotte as head of the institute, all bets are off. The Magister is still out there waiting to use Tessa's gifts for his own nefarious purposes and rogue Shadowhunters within the Clave are helping him. Frightened for her safety, Tessa is also caught between her feelings for the dark broody Will Herondale and the sweet but dying Jem Carstairs. Will is finally able to destroy his demons and open up to Tessa but it may be too late. This is another good installment in the Shadowhunter universe. I didn't think I would like Tessa's story and I didn't want to be caught in a love triangle book, but Tessa grew on me and I enjoyed learning more about her "gift." The love triangle is not so much an "either or" as an "all of the above"… Will, Tessa and Jem all love each other and are willing to make the ultimate sacrifice for each other. 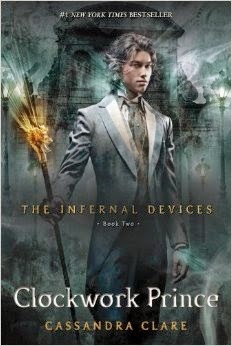 Fans of the Shadowhunter world will eagerly look forward to the conclusion of this trilogy.